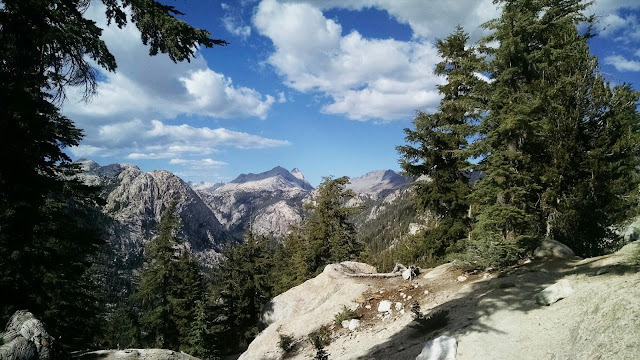 Hikers I met heading north kept telling me the mountain scenery was going to get even better as I got further south into the Sierras. I found it hard to be true, but it turned out to be so. 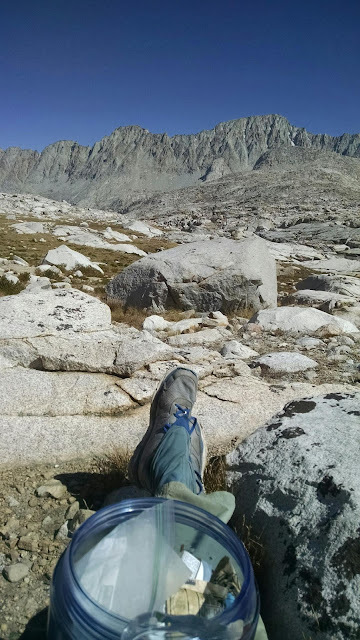 I'm now south of Mt Whitney and out of the national parks (Yosemite, Kings Canyon, and Sequoia), so I'm fairly sure I've hit peak Sierra splendor. I still have about 90 miles to Walker Pass and into the Mojave, but a kind local offered me a rest. 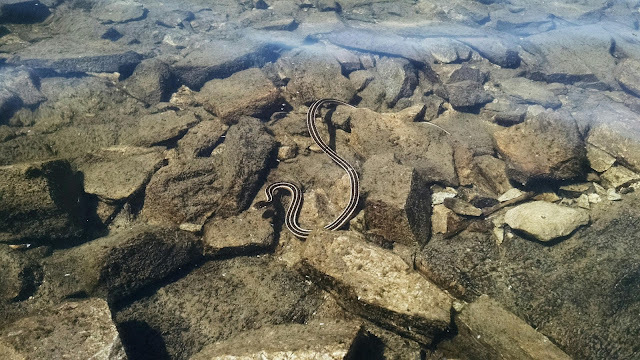 There has been lots of hiking company on this section. 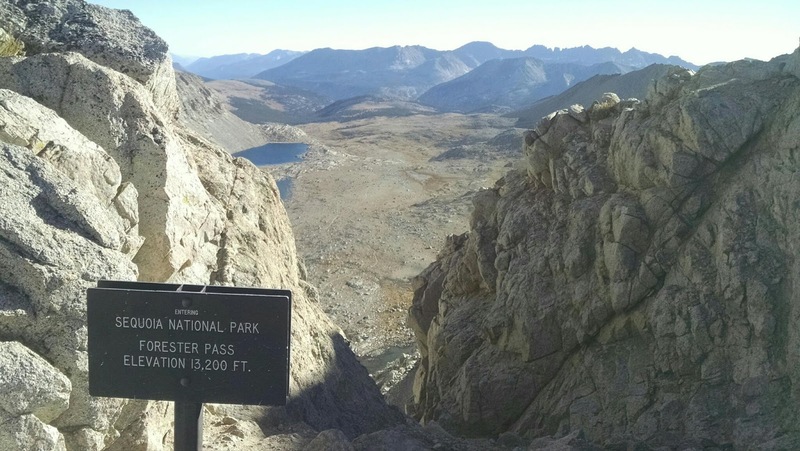 Many people hiking the 200+ mile John Muir Trail and many other section hikers. That has been a nice change, and hiker boxes have been well stocked. Weather is near perfect except for a couple cold snaps that included snow and an hour of steady rain. Nights have been chilly with a couple drops into the teens. I have so many pictures of mountain passes and lakes I'm not sure which are which. Below are my favorite pics from this section. Lots of panorama shots as the views are have been expansive. 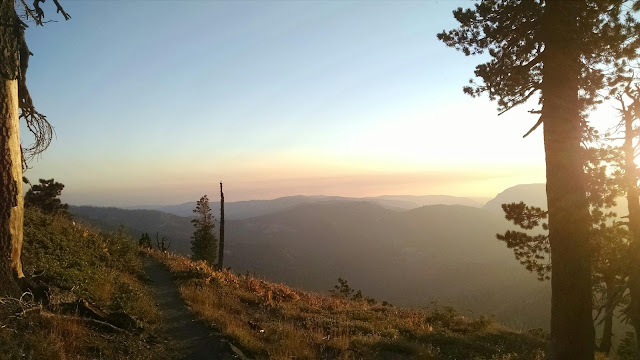 Hiking into the sunset out of Donner Pass. Nice ridge hiking around Lake Tahoe. 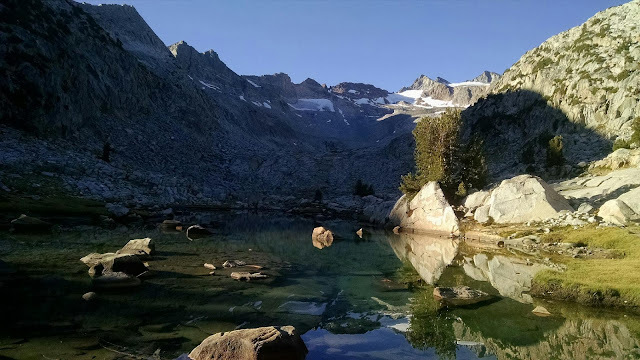 Aloha Lake, a nice spot for a swim, in the Desolation Wilderness, the first very crowded section of trail. 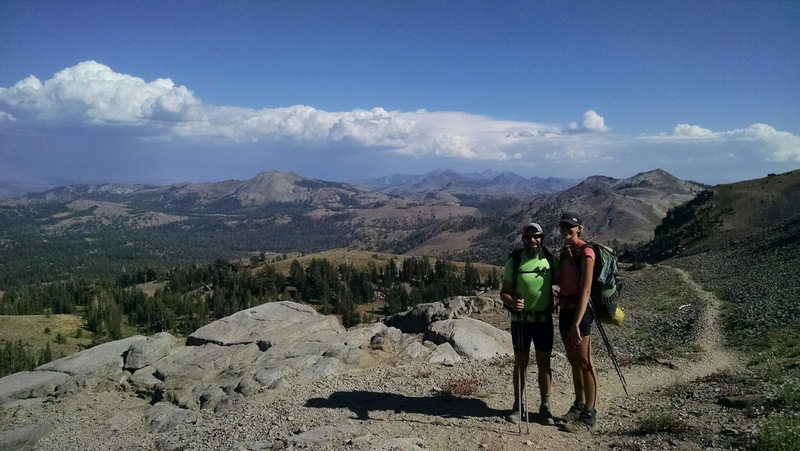 Long Game and Meriwether, good hiking company for a day south of Tahoe area. The weather forecast I got out of South Lake Tahoe was a cold front coming through on Tuesday, with a 20% chance of rain. Near the trail head a local day hiker informed me snow levels were expected to be around 9000'. I camped at 9100' that night, and sure enough, there was snow, the first precipitation I've seen since Washington. I got stuck in Bridgeport, CA waiting for a FedEx package from Walmart, which is a long story to be told later about an experiment with resupplying. 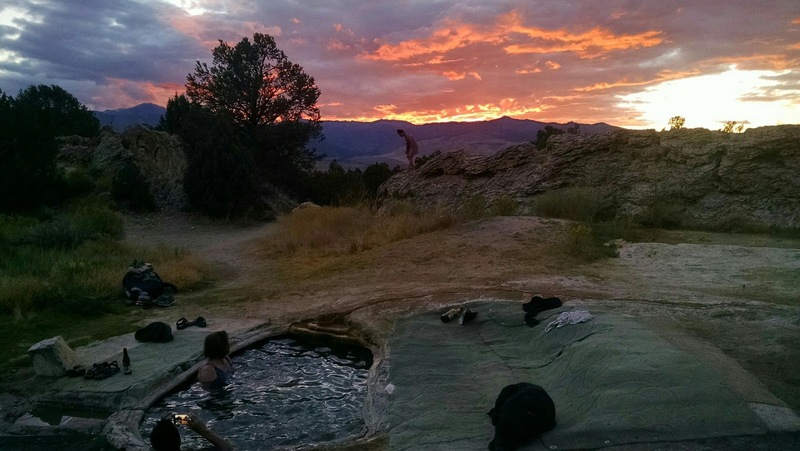 The good news was there are hot springs about 2 miles out of town, a good place to hang out and camp for the night. Plenty of company there and nice sunsets on the east side of the Sierras. 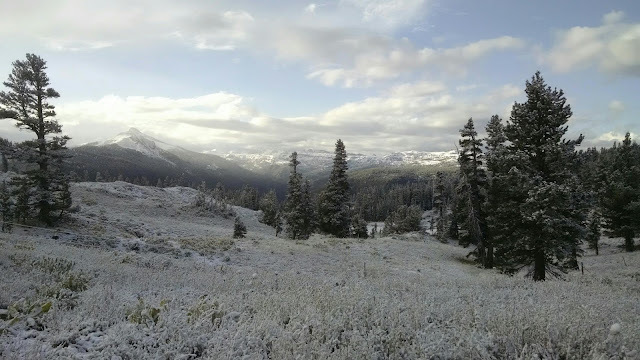 Out of Sonora Pass and into Emigrant Wilderness on a cold evening. 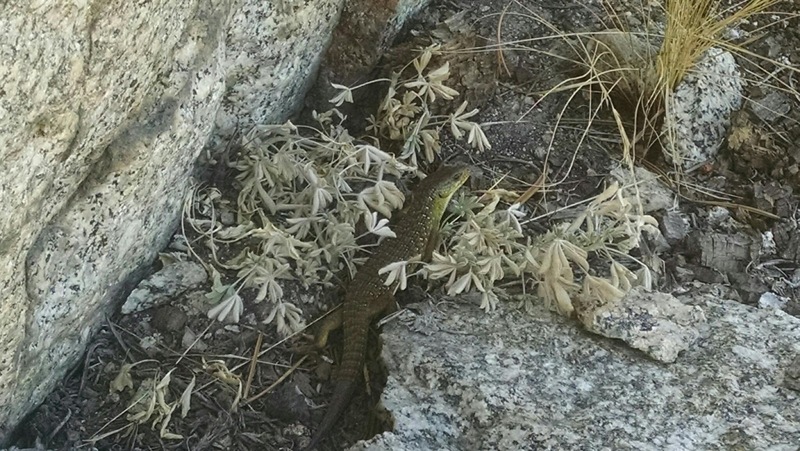 A skink, I think, in the Sierras. One of many nice lakes for a break. 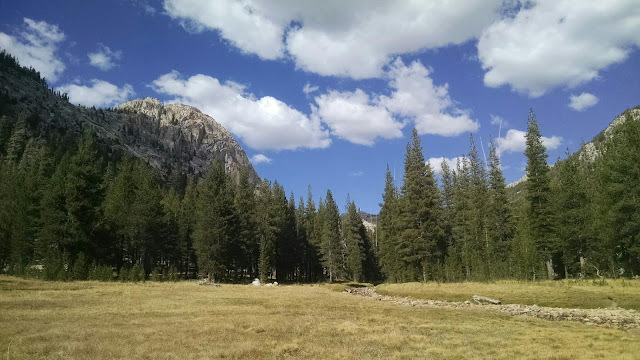 One of many nice meadows I hiked through in Yosemite. The alternative to easy meadow hiking in Yosemite is steep up and down canyon hiking. On the way up to a big pass on the southern Yosemite border. Thousand Islands Lake, with a bit of smoke from a distant forest fire. I noticed this snake in the Thousand Islands Lake after I jumped in. I was amazed given how cold the water was. Lunch view. I think that was Smedberg Lake. Rick #1 at an undisclosed location in a remote area of the Sierras. 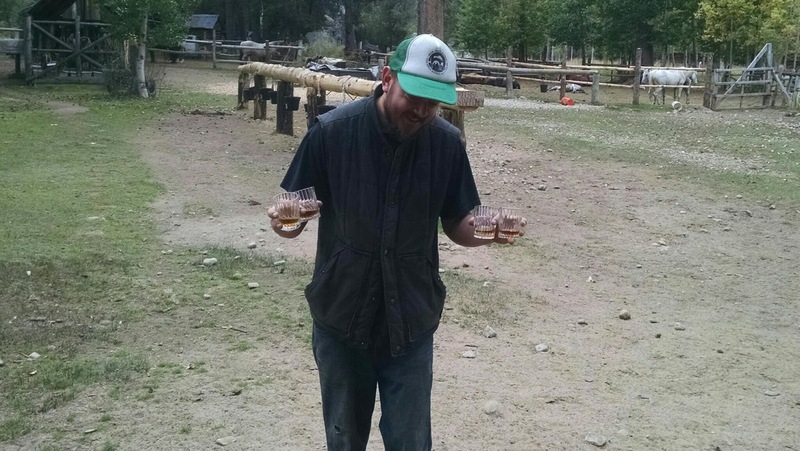 He gave me and two other hikers access to copious amounts of hiker box food, a couple beers, followed by shots of Jack Daniels before we went to go soak in nearby hot springs. Rick #2 warming in the sun. After the hot springs I got rained on for an hour or two and the cold front moved in. I arrived to a campsite where another Rick had a nice fire going next to McLure Meadow. We had a nice conversation before the rain returned and he offered me a hot cup of coffee in the morning. Breakfast break on my way up to Muir Pass. Temps in the 30s and very windy, so I was tucked behind a rock. A cold but amazing hike up to Muir Pass. I chased the guy in the foreground up, who passed me while I was having breakfast. He looked fast so we had a friendly competitive hike to the top. 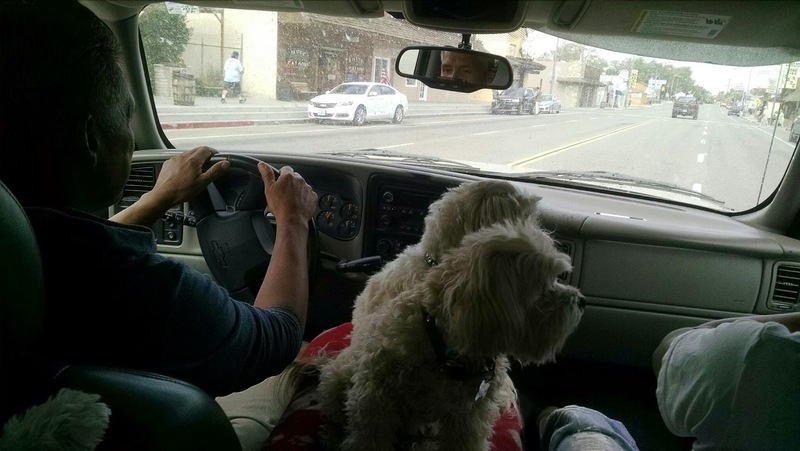 Trying to hitch out of Independence back to Onion Valley, Freddie (left) stopped and asked me where I was going. He offered me a bed, shower, laundry, food, etc. at his second home fixer upper in town. 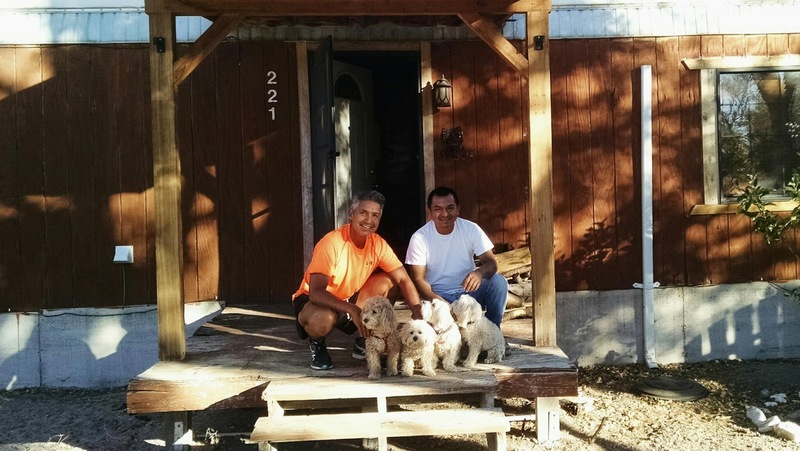 Ricardo (right) and the four dogs were there doing some work on the property. Ricardo only speaks Spanish so I got a reminder of how little Spanish I can speak, but learned a few new words. Kearsarge Pinnacles from the pass. 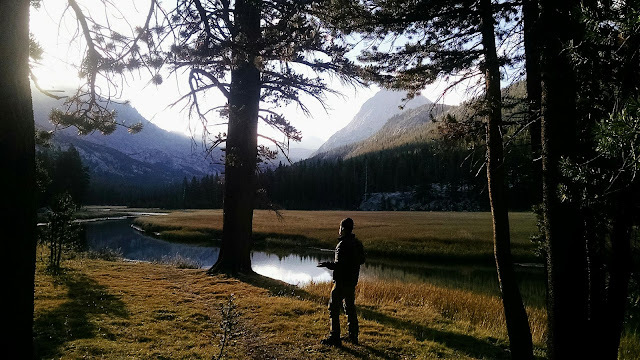 Extra miles out to Onion Valley to get food, but not a bad view on the way back. The highest point on the PCT. 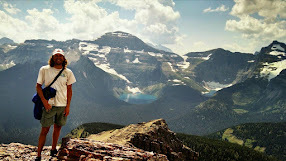 Dirty hiker on top of Mt. 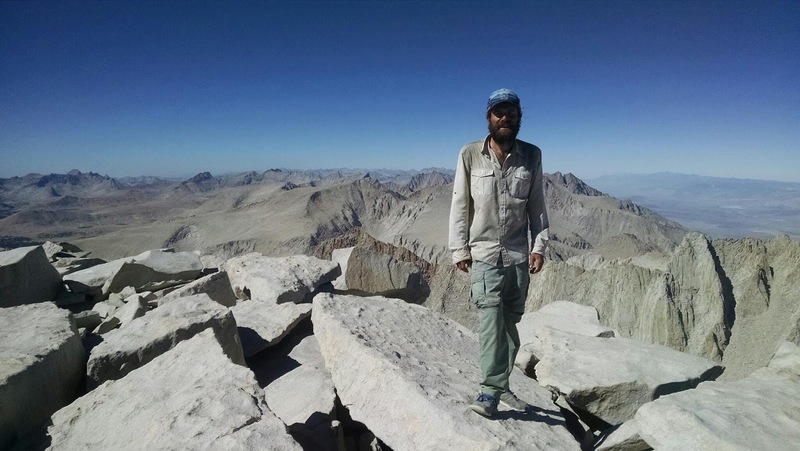 Whitney, the highest point in the lower 48, about 14,500'. 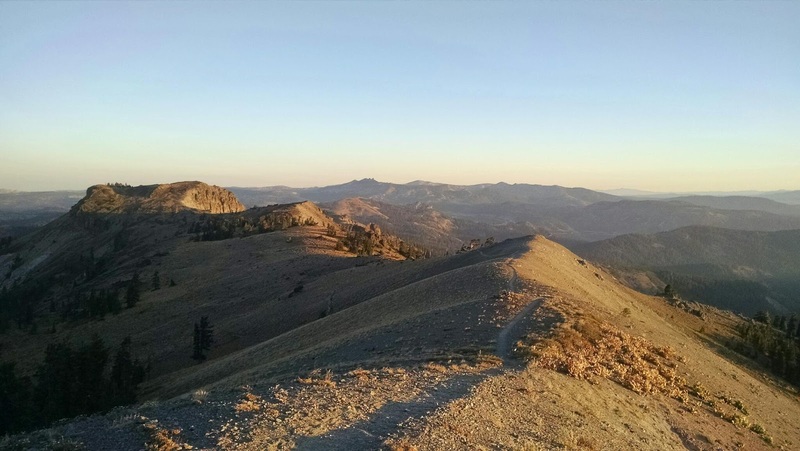 It's about a 17 mile side trip from the PCT. Note those $18 Starter running shoes from Walmart still going with over 600 miles on them! 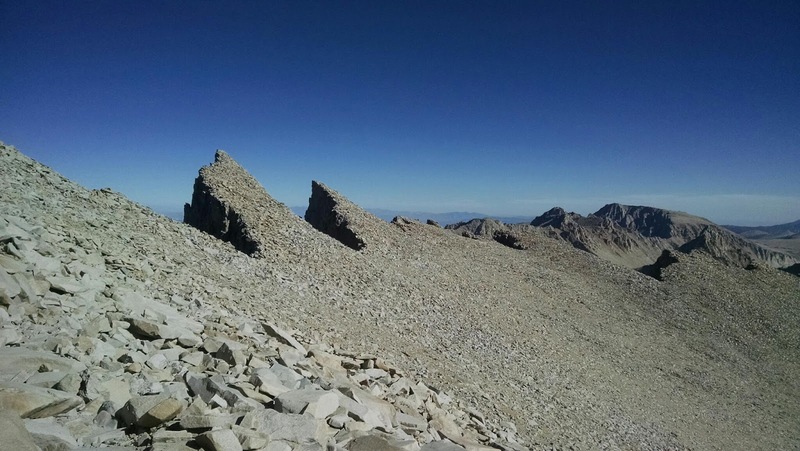 The view coming down Mt Whitney. Once I got to Horseshoe Meadow I hitched into Lone Pine to resupply. Guess who was passing through on the way to Independence? Freddie, Ricardo and dogs, so instead of heading back to the trail I'm taking a rest!